Ready to achieve the healthiest and most beautiful smile possible? Contact our team using the form located below the map, to schedule a consultation with our experienced dentists. If you prefer, you may call us by phone to ask questions and to set up an appointment at a time that’s convenient for you. Our friendly and knowledgeable team is dedicated to your care. Let us know how we can help you smile more easily. We appreciate you taking the time to contact us. 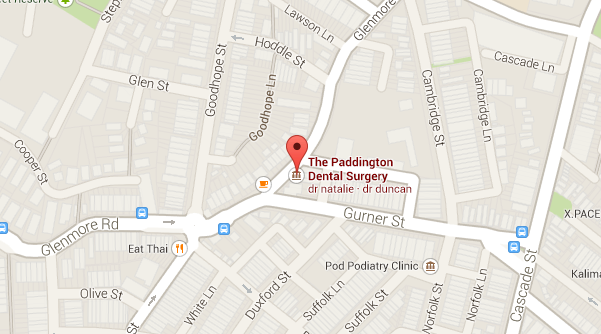 Our experienced dentists and skilled dental team here at The Paddington Dental Surgery are delighted to have the opportunity to help you improve the health and appearance of your smile. We are a family and general dentistry practice with one of the best reputations in the country, and we offer a comprehensive array of treatment options that can help you restore both form and function to your teeth for many years to come. Our practice is committed to providing gentle pain-free dental care in an environmentally conscious setting, and we place great emphasis on providing an experience that is not only effective for your dental needs, but also pleasant and relaxing. Thank you again for your interest in our practice. Please fill out the below for more information or to make an appointment. Alternatively, just call us. We look forward to answering your questions and helping you achieve a brighter, healthier, happier smile.